On October 9th, 2018 AmCham organized a media breakfast where we presented the “U.S. Investments in Bulgaria (1990 – 2016)” Report. It was very successful event that achieved all goals we planned. The media coverage proved it. As you remember during our successful business breakfast with the Prime Minister and members of the Government (September 18th, 2018) we used some of the highlights of the report to convey many messages. We stated that the United States have long-term economic relations with Bulgaria, and that U.S. companies invest funds, know-how, and passion in our economy and society. The report is our main document of the year. 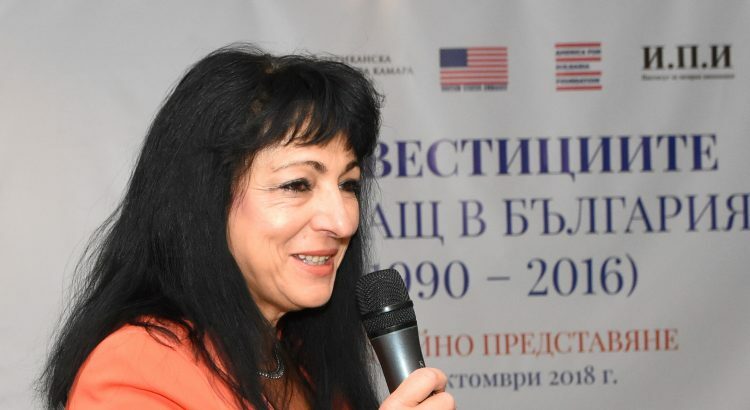 It shows the real volume and significance of the U.S. investments in Bulgaria, which before the analysis were underreported. Now we know that the overall volume of the U.S. investments is BGN 4.5 billion, and even the experts from the Institute for Market Economics who prepared the report say that it is a bit conservative. The American investments are focused in four sectors – processing industry, energy, ICT, and agriculture, – and contribute to the success of regions such as Razgrad, Gabrovo, Stara Zagora, Sofia, and others. The bottom line here is – we have a great content with this report. So, please read it, and share it among your business contacts. This little act will increase It is important for AmCham Bulgaria that we show our shared values, and we support our main causes and priorities. It was our responsibility to invite and to speak before media about the U.S. investments and success stories in Bulgaria Today media is not only important stakeholder of any organization like AmCham, but it should be our partner in communicating with various groups and the public at large. Thus, the event was important to position our organization and our leadership as competent, communicative, and wise professionals. In my view the Executive Director and the AmCham Team did great job with that regard. Also, I would like to personally thank our colleagues – Ms. Dessislava Talyokova, America for Bulgaria Foundation, and Mr. Krassimir Nenov, CEO, ContourGlobal Maritsa East 3 – who joined me during the mini-discussion panel. Their thoughts and remarks showed how versatile and committed organization we are, with members whose strategic goals match with those of the country. Speaking about education, innovation, partnership with communities, is always inspiring. Once again, I would like to thank the sponsors and the supporters of the preparation of the report, and its publication. I would like to thank those companies that trusted us and shared their financial data in a way to make the report more accurate. Last but not least, big credit goes to the AmCham Team.